Announcement has been made through various sources of the anticipated fourth archaeological expedition to Tel Lachish. Archaeologists who have been working at Khirbet Qeiyafa (the Elah Fortress), Yosef Garfinkel, Michael Hasel, and Martin Klingbeil, announced a new excavation at Lachish in the Nov./Dec. 2013 issue of Biblical Archaeology Review. BAR has made available a collection of seven articles dealing with the third excavation (1974-1984) under the direction of Prof. David Ussishkin. These links may be broken in the near future, but if you have access to the BAR on CD or Logos this may serve as a helpful bibliography. David Ussishkin. “Answers at Lachish.” Biblical Archaeology Review, Nov/Dec 1979. David Ussishkin. “News from the Field: Defensive Judean Counter-Ramp Found at Lachish in 1983 Season.” Biblical Archaeology Review, Mar/Apr 1984. Yigael Yadin. “The Mystery of the Unexplained Chain.” Biblical Archaeology Review, Jul/Aug 1984. David Ussishkin. “Lachish—Key to the Israelite Conquest of Canaan?.” Biblical Archaeology Review, Jan/Feb 1987. David Ussishkin. “Restoring the Great Gate at Lachish.” Biblical Archaeology Review, Mar/Apr 1988. Steven Feldman. “Return to Lachish.” Biblical Archaeology Review, May/Jun 2002. Philip J. King. “Why Lachish Matters.” Biblical Archaeology Review, Jul/Aug 2005. Lachish is thought to be the second most important city of Judah after Jerusalem. This is based on the fact that both the Assyrians and the Babylonians destroyed the city immediately before moving to Jerusalem. Rehoboam (931-913 B.C.) built Lachish and other cities in Judah for defense (2 Chronicles 11;5-9). Other kings fortified them to be used for the storage of food, oil and wine. 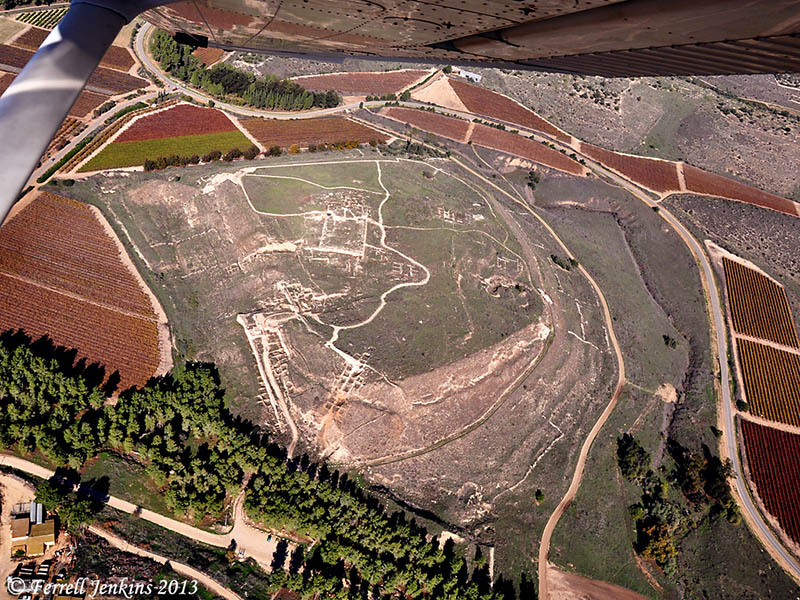 Our photo below shows Tel Lachish from the air. In the bottom left quarter (south west) of the photo you will see a small parking lot with a path leading through them to the gate of the city. To the right of the path, beginning at the grove of trees you will see the siege ramp built by Sennacherib, king of Assyrian, in 701 B.C. 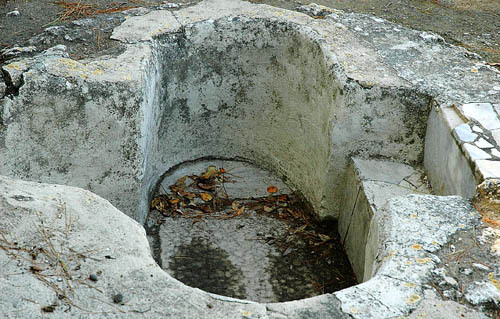 The photo also shows the defensive Judean counter-ramp found in the 1983, and described by Ussishkin in the 1984 article. Tel Lachish from the air. Photo by Ferrell Jenkins. Use the Search box to locate other entries on Lachish. 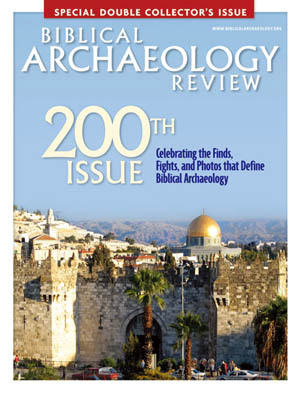 Yesterday I received the 200th issue of Biblical Archaeology Review. I have all issues of the magazine since that first small single color issue in March, 1975. When I bought the earlier issues in Libronix format for the computer I gave my paper copies to a young teacher. Not everyone likes BAR. It has been a controversial magazine. No wonder. Editor Herschel Shanks has been controversial. But, I have enjoyed it all the way. I first met Herschel and his right hand gal, Suzanne Singer, at the ASOR meeting in New Orleans in 1979. I ate at the same round table with them, Prof. David Ussishkin, and Prof. William Sanford LaSor. Still, every time I see Herschel. I have to go through the introduction process. Before BAR, unless we attended the annual meeting of the American Schools of Oriental Research, we had to depend on the reports in Biblical Archaeologist for popular articles on archaeology. My recollection is that the magazine was often late and the photography poor. Agree or disagree about Shanks and the magazine, one thing is for sure. It has made biblical archaeology a popular topic. More information about this issue, with an opportunity to buy and subscribe, may be found at the magazine web site: Biblical Archaeology Review. A first personal article by Gabriel Barkay on “The Riches of Ketef Hinnom.” It was during this excavation that Iron Age tombs were found, one of which contained the tiny silver plaque with the oldest known text of a Bible reference. Photos by the late photographer David Harris. BAR’s Crusades, like the one to get the Dead Sea Scrolls published.